On their self-titled 2012 debut, the Modern Grass Quintet introduced local audiences to a new strain of bluegrass whose roots run to the origins of the genre yet bloom in the light of more contemporary influences. The seminal works of Bill Monroe, Lester Flatt and Earl Scruggs is always fertile and foundational soil. But this band fertilized its sound with influences ranging from the newgrass stylings of Jerry Garcia and David Grisman to the gothic folk of Gillian Welch and David Rawlings, and even the Beatles. The result was a record that honored bluegrass tradition while adopting and adapting new inspirations — which itself has become a certain kind of bluegrass tradition. Retooled and reinvigorated, MGQ are back with a new album, Bellwether, that pushes that fusion of classic and current aesthetics. The record opens on bandleader Andy Greene's "Home From the Mills." It's a lively cut that puts a twangy spin on city living but ultimately serves as a love letter to life in the country. In his easy, pleasant tenor, Greene reminisces about playing his guitar for "rich folks and fools" in the "dirty, gray city," before finding an oasis, and eventually a home, "up in the woodlands of sleepy New England." Mandolinist Stephen Waud takes the lead on "Gallows Pole," a dark, rustic tale of a murderer who escapes the hangman's noose by framing another man. It's a clever and chilling twist on the classic murder ballad, one made gloomier by the band's sinister arrangement. Since their debut, MGQ have shuffled their lineup. Gone are fiddler Joe Cleary and banjo ace Steve Light, two of the area's most highly regarded bluegrass players. Filling those immensely large boots are mandolinist and banjo player Adam Buchwald and fiddler and resophonic guitar player Todd Sagar. Both prove eminently capable. And it seems they also bring a more traditional approach to the band. On instrumental tunes such as "Free at Last" and "Stomping Buck," MGQ delve even further into the history of the genre than on the band's debut. Both songs have a whirling, British Isles-style flair — apt reminders of the genealogy of bluegrass music. But MGQ's calling card remains the band's savvy blend of old and new. The highlights on Bellwether are those songs in which that tack is most ingeniously employed. The instrumental "Spider Bridge" veers into melodic newgrass and is a fine collective showcase — as is the Sagar-led "Too Late to Classify." "Dance With the Bottle" is a rambunctious barn burner that, with electric instrumentation, would be an equally effective alt-country tune. And "Doing My Time" features another sly writing turn from Waud, not to mention the album's most fiery picking. 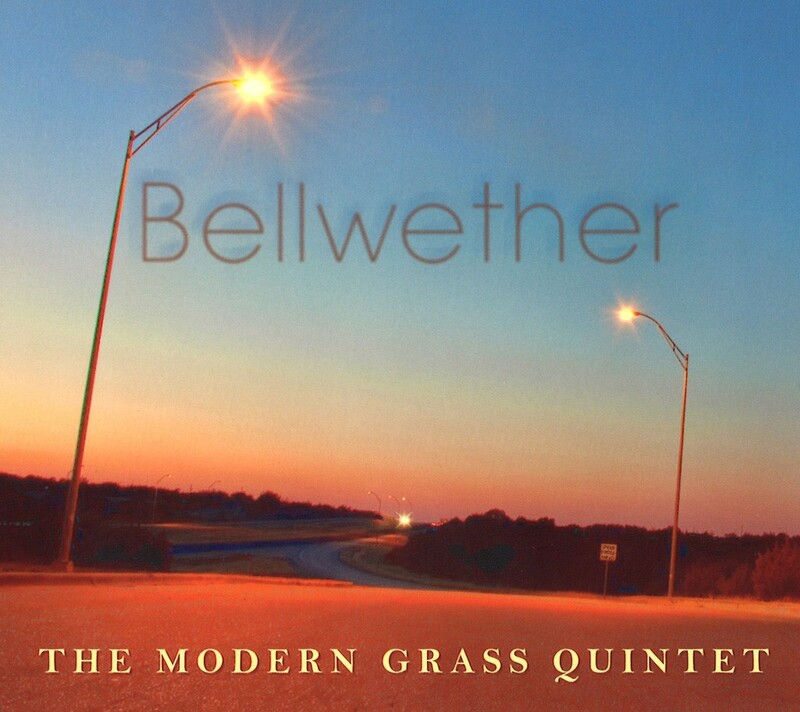 Bellwether by the Modern Grass Quintet is available at CD Baby, Amazon and iTunes.